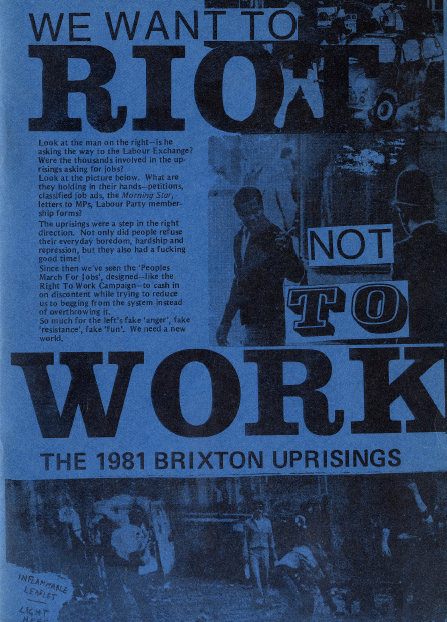 Pamphlet reflecting on the 1981 anti-police riots in Brixton by the Riot Not To Work Collective. Gratefully taken from the fabulous Red Notes. 30 years on today...Always loved this photo(the one that appears if you roll down about a third of the way - the one that shows of the methods of rolling over the economy). Anybody got other recollections (for those of us over 38)? I tried to upload put the pamphlet in its entirety (PDF), but it's not playing so you can download the pamphlet from Red Notes here.